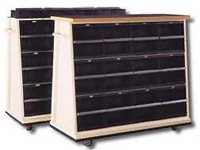 American Eagle Systems features a wide variety of mobile carts which can be used at your data center or offsite storage locations. 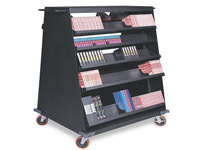 These carts can accommodate all types of media and come in a wide array of sizes to fit your needs. 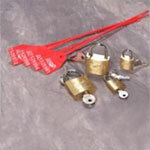 Rugged, heavy gauge steel design. Heavy duty casters, (two swivel with brake and two fixed). Steel-reinforced corner bumpers. Total load rating of 3000 lbs. 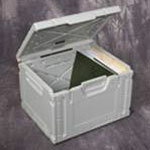 Removable doors have foam lining and a two-point latch and lock system to protect packs and media. 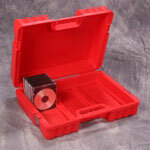 All welded, cold rolled steel construction for movement of media within the tape library environment. 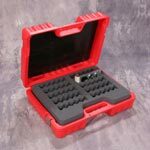 4 models and capacities from 240 to 560 3480/3490 tapes with standard E480CLR packs and accommodates Flex-Pak multimedia packs. Angled side design, 22 inches deep at the base. Riveted extended rubber bumper around perimeter of base. 2 fixed, 2 swivel 3 inch rubber tread casters with 880 lb total load rating. 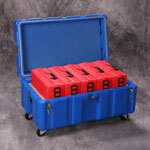 American Eagle Systems has an extensive line of offsite cases for your standard or customized needs. 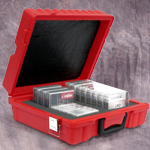 We strive to provide the most durable and safe products to move your valuable media to offsite locations. 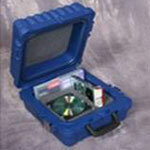 Our cases offer many features to protect your data. 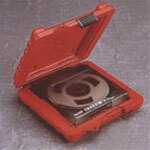 Double wall case which reduces G forces resulting from impact. 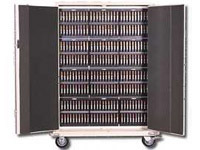 Molded dividers sized to the precise dimensions of each tape format cradle each cartridge and prevent shaking/rattling. 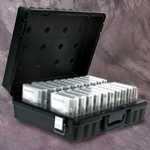 Trapped air space provides insulation from external temperature changes and use of foam only with tape and disk formats where plastic cases are employed protects media from contact with debris generating agents inside the case.